Nothing gives a person a sense of purpose like a job where he or she can learn and apply new skills, work with a team and experience real success. Dragon Works lets Damar Charter Academy students experience that sense of purpose at school while also preparing to experience it at a workplace in the community. Providing work-skills, training and hands-on experience to Damar Academy Students. Dragon Works prepares students for the workplace and equips them to be the workers needed by area employers. Through this process, Dragon Works helps students develop lives of purpose and growth while also offering employers a way to connects with trained, reliable and hard-working employees. Dragon Works helps students acquire the “soft skills” required to work with others, to connect with customers and to be self-motivated and guided. These skills currently focus on environments including retail, warehouse fulfillment and construction. 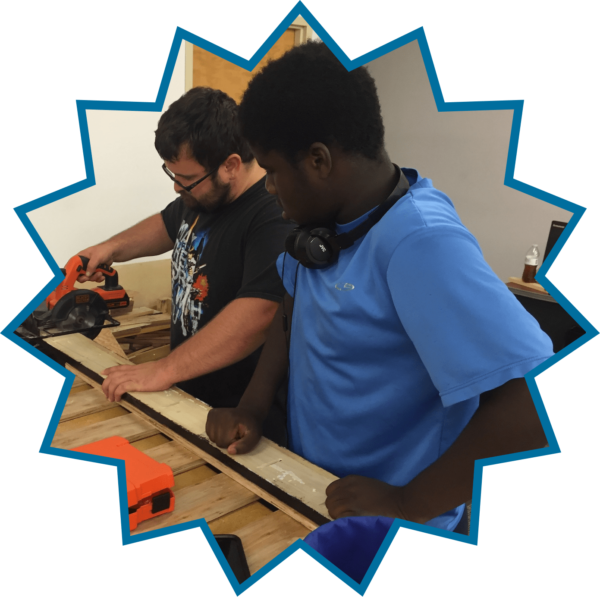 Dragon Works provides hands-on training program that currently consists of operating a coffee shop (the Dragon’s Den) and a wood shop where students design and build tables and home décor from wood pallets. Dragon Works will work with you to shape a training program specifically designed to prepare students to work in your business.